I actually quite like my Eggless Whole Wheat Oats Cookies images. To me they are far better than what I was clicking around that time. 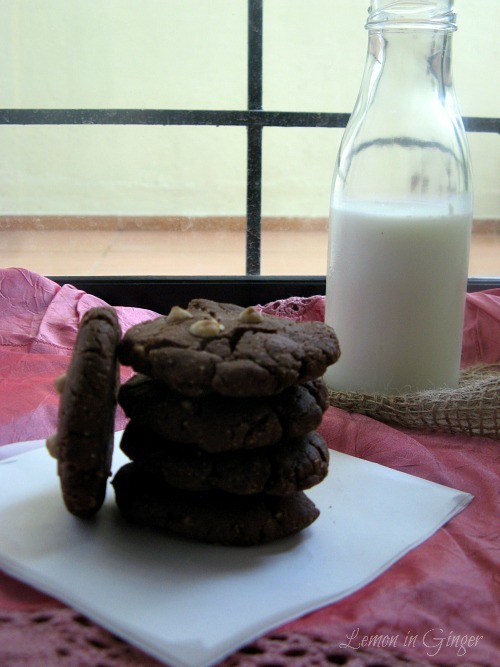 The stacked cookies is an image which depicts the mood well. But these images are no where perfect. Actually not even starting to be perfect! What I like in these images the effort gone into composing each. I even created a cookie monster collage showing the click after each nibble. This was the first time, where I took inspiration from flickr & Pinterest. There is a lot desired in terms of clarity, lighting, etc but I was happy and still proud of my efforts. 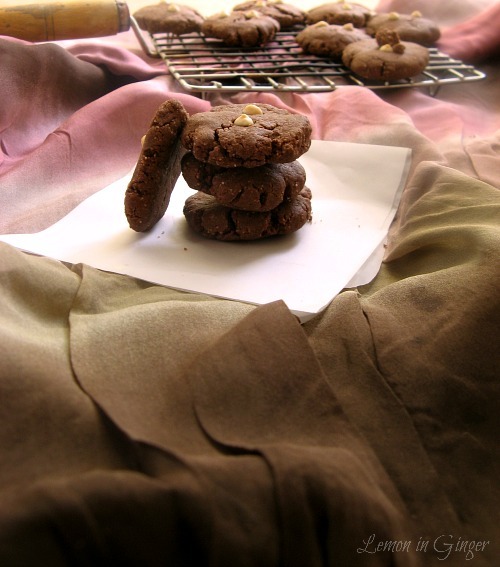 So today I am sharing how I shot the same cookies armed with better knowledge. 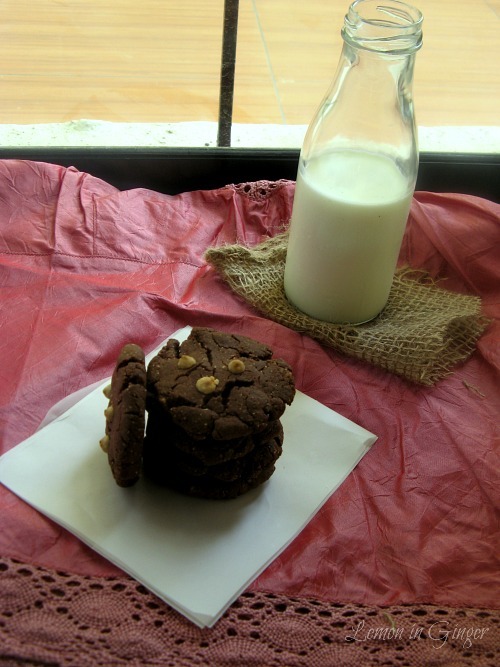 A healthy take on Cookies. 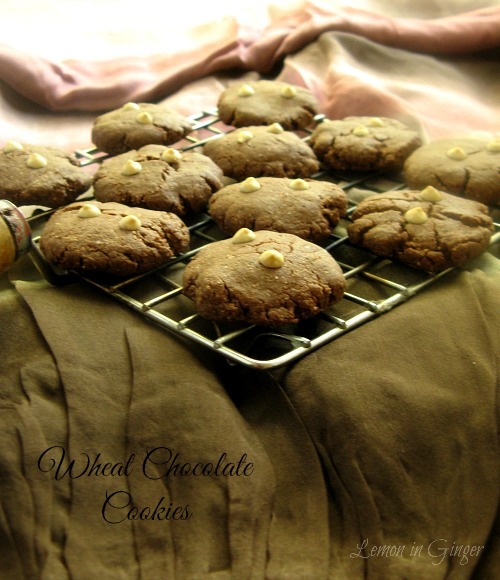 Use Whole Wheat flour to get cookies which are flavorful & can be indulged in. Remove 1 Tbsp flour from 1 Cup. Sieve together wheat flour, cocoa powder, semolina & baking powder. In a large bowl, beat together butter and castor sugar till light & fluffy. Add vanilla essence. Beat for couple of minutes. Add dry mixture to wet mixture slowly with your finger tips till it resembles bread crumbs. Slowly knead a soft dough with your hands. I had to add 1 Tbsp milk as my dough was too crumbly. Wrap the prepared dough in cling film & refrigerate for 1/2 hour. In the meantime, pre-heat the oven to 180 C. Grease the baking tray. Remove the dough from fridge, slowly knead it again. Break the dough into small balls and gently press them into discs. Place these discs onto the prepared tray 1 inch apart from sides & each other. 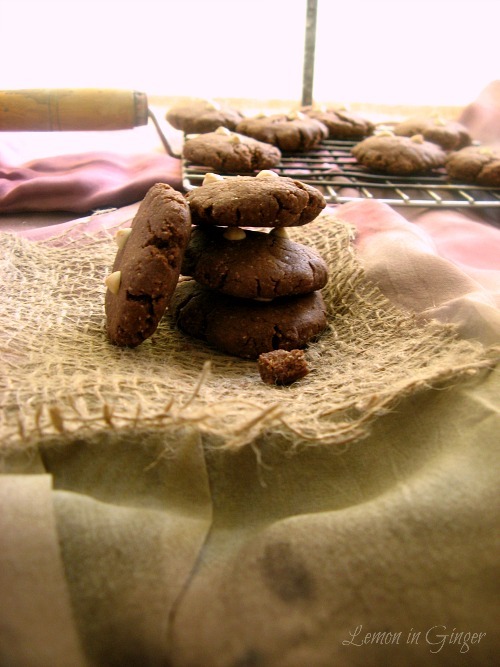 With the help of a fork, make small indentations on the upper layer of cookies. If desired, add some chocolate chips on top. Bake for 10-12 minutes till golden brown or done. Cool on a wire rack & allow to cool. Store them in an air-tight container. The dough can be refrigerated overnight as well. If you are in a hurry, chill the dough in freezer for 15 minutes. Use APF for regular cookies.